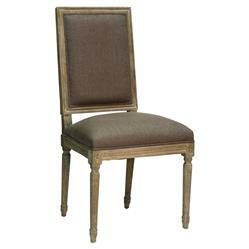 Dine like a king on this elegant, yet rustic dining chair in the Baroque French style. Chic aubergine brown linen upholstery gives the spotlight to intricate detailing on the strong oak frame. Item sold as a pair.